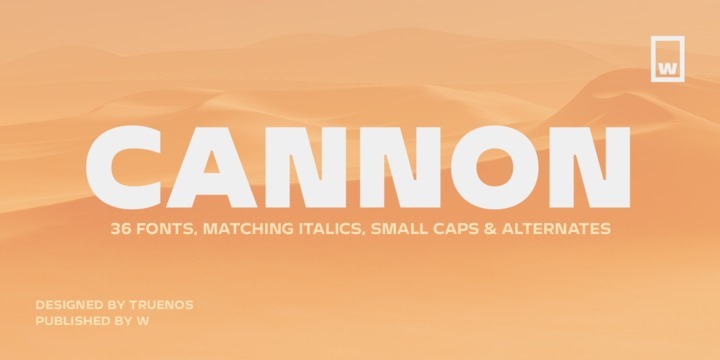 Cannon is a sans serif typeface created by Patricio Truenos and published by W Foundry which is a mix between the classic sans neo-grotesque elements with geometric elements. It is a vintage font little touched by tehnology, ideal for any kind of project such as editorial use, magazine, logo, book cover, display, poster, print but also for web. It comes in 36 styles, 2 widths (Normal & SC ) each with 9 weights (from Thin to Black) and italics and a wide range of OpenType features. Have fun! Styles: Normal, SC, Thin, Light, Regular, Book, Medium, Bold, Black, Italics. A font description published on Monday, June 4th, 2018 in Fonts, Patricio Truenos, W Foundry by Alexandra that has 1,176 views.